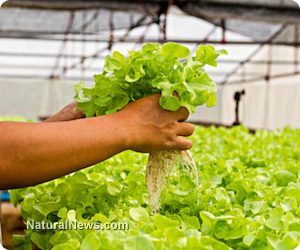 (NaturalNews) We talk a lot around here about food and its importance in sustaining life. But how do we as humans continue to sustain the viable production of food itself, particularly in a world where natural resources seem to be getting increasingly more scarce? One of the answers to this question may be aquaponics, a unique method of growing food that utilizes the normal functions of both plants and fish to grow high volumes of food in compact spaces. If you are an urban-dweller, you may have already come to appreciate the availability of fresh produce and other goods at your local farmers market, products that primarily come from local farms and greenhouses. But what if we told you that aquaponics is also responsible for bringing fresh food to your table? It's true. Everything from greens and herbs to beans and legumes can be grown in aquaponic environments, which just so happen to work especially well in urban environments where land is limited. "Aquaponics is a method of combined fish and vegetable farming that requires no soil," explains Roman Gaus from The Atlantic Cities about the process. "The farmer cultivates freshwater fish (aquaculture) and plants (hydroponics) in a recirculating water system that exchanges nutrients between the two. Wastewater from the fish serves as organic fertilizer for the plants, while the plants clean the water of fish feces and urine." Because aquaponics is essentially a closed system, with the exception of fish food having to be cultivated or purchased separately, it can function independently, and without many of the normal inputs required for traditional farming. This means that a well-designed aquaponics system can be installed and operated virtually anywhere, including in dense urban environments -- high-rise rooftops, the tops of parking structures, and even basic parking lots are just a few examples of the many locations where high-output aquaponics systems can work. This is good news for the many urban farmers with limited access to clean, unpolluted growing soils. A well-designed aquaponics system with stacked growing pods is capable of growing high volumes of fruits and vegetables -- according to Gaus, a 2,700-square-foot greenhouse farm he is currently building on a rooftop in Basel, Switzerland, is expected to produce more than five tons of fresh vegetables and roughly one ton of fish per year. Even better is the fact that, compared to conventional fish farming methods, aquaponics uses 90 percent less freshwater and requires significantly fewer added nutrients to raise the same amount of fish. Likewise, fruits and vegetables can be grown effectively without the need for pesticides and other synthetic chemicals and inputs, all of which are known to destroy the environment and human health when used in conventional agriculture settings. "We are only beginning to understand the vast potential of aquaponics rooftop farming in the city," adds Gaus. "I am convinced that it will prove a working, robust, and scalable solution to feed growing urban centers in the 21st century."